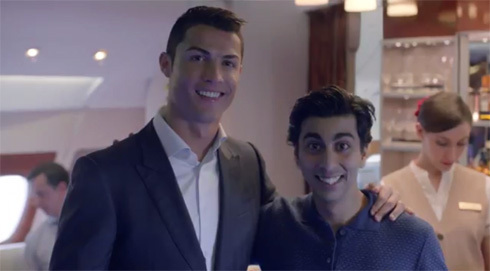 Cristiano Ronaldo has been named the new ambassador of Fly Emirates earlier today and has already appeared in the airline's new advert video for the upcoming FIFA World Cup. Next to him in this film was the legendary Pelé, beyond any doubts one of his home country's main flagships. Pelé has naturally been heavily involved in the whole organization and promotion of next summer's World Cup that will be hosted in Brazil. This Friday, "Fly Emirates" has announced Cristiano Ronaldo as their new ambassador for the upcoming FIFA World Cup that will take place in Brazil. The airline company, who is currently on a 4-year sponsorship deal with Real Madrid (2013-2017), has now also engaged into a strong partnership with FIFA that will include, among many other things, the organization of a big series of flights that will connect several major cities across the World to Brazil. 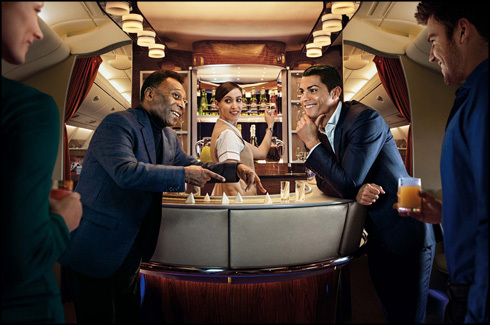 Cristiano Ronaldo and Pelé were the celebrities chosen to appear in the new Fly Emirates promotional video for this forthcoming FIFA World Cup, and the result can be see in the video below. And since we're speaking of Fly Emirates, there's a thrilling and decisive match in England this Saturday, with an Arsenal vs Manchester City taking place at the Emirates Stadium. It will basically be a "all or nothing" game for Arsene Wenger's men in an attempt to keep their title hopes alive. 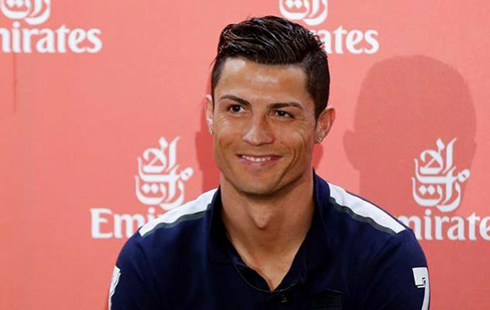 To mark the special occasion of becoming the new ambassador for Fly Emirates, Cristiano Ronaldo showed up to a press event held in Madrid and granted a few statements to the journalists, regarding his expectations for the 2014 FIFA World Cup. Just to remember, Portugal was drawn with Germany, USA and Ghana in Group G and will make their debut precisely against the "Mannschaft", on June 16, in Salvador da Bahia. Cristiano Ronaldo: "We are not favorites for this World Cup, which I honestly believe that can be positive for us. We'll be able to go into this tournament without much pressure in our shoulders since everyone knows that teams like Spain, Brazil, Germany, Argentina are the main favorites and that's just fantastic to us", started by pointing out the Real Madrid super star. Ronaldo: "I'm quite confident that we'll do good in this tournament, even though we got drawn in a very difficult group [with Germany, the United States and Ghana]. Basically we'll just try to think step by step, game by game, despite our very first game being against Germany. Nevertheless, I believe we'll do a fantastic World Cup and we'll go through it without much pressure, which will be great", remarked the 29-year old, who probably looks at this WC opportunity as his best chance to get some silverware for Portugal while he still is at his peak. Ronaldo: "I'll be watching every game I can, as long as it doesn't interfere with my own training schedule and matches of course. The World Cup is an amazing competition for every fan to enjoy. I'll be following both Brazil and Spain very closely though, simply because I have many friends playing for those teams". As for the comments on the Fly Emirates' video that was published a few hours ago on Youtube and where Cristiano Ronaldo co-stars with Pelé, the Portuguese star didn't have problems in admitting his admiration and utter respect for the Brazilian giant. Ronaldo: "He's a legend! Generations can change but everyone knows how great he was. I was glad to have had the opportunity to show him how much I appreciate and respect both him and his generation. He has always been a true role model for me", stated the 2013 FIFA Ballon d'Or winner. Cristiano Ronaldo next game for Real Madrid will be against Rayo Vallecano, on March 29 of 2014. You can watch Juventus live stream, Real Madrid vs Rayo Vallecano, Espanyol vs Barcelona live, Man Utd vs Aston Villa, Arsenal vs Man City and Southampton vs Chelsea, all games provided from our soccer live stream pages.